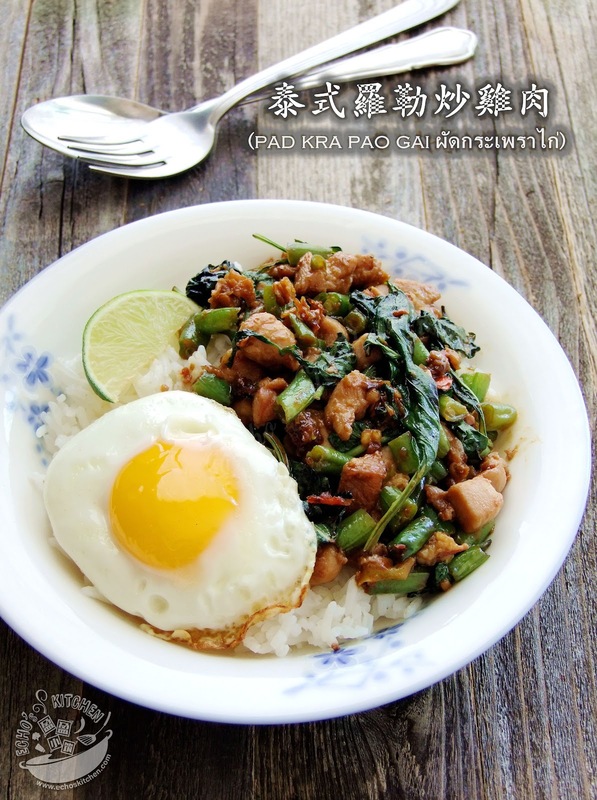 I had previously made Pad Ka Prao using minced Chicken, Turkey and Pork, all turned out very nice and tasty. 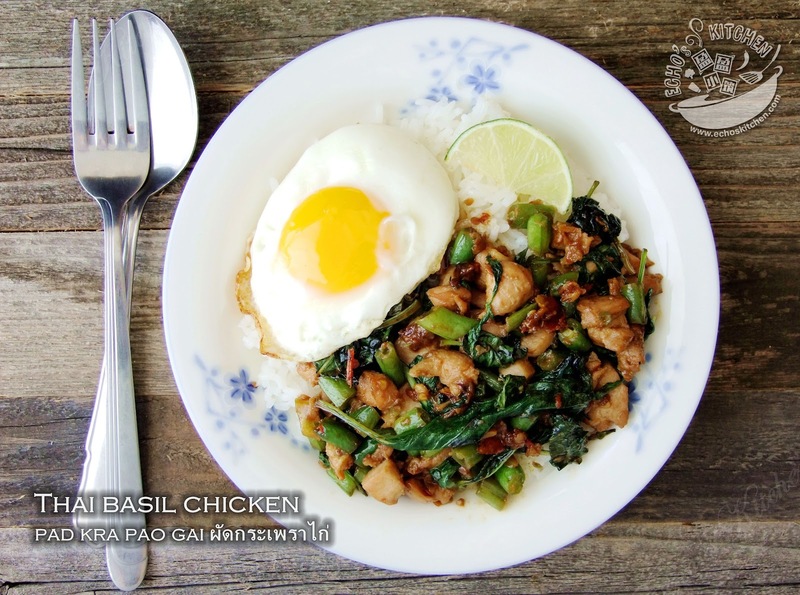 This time I have used diced chicken and added some long bean, it allows us to have more vegetables and hubby loved it so much, he had 2 plateful! 1. Diced and marinate chicken pieces with some cooking wine, salt and pepper powder. 2. 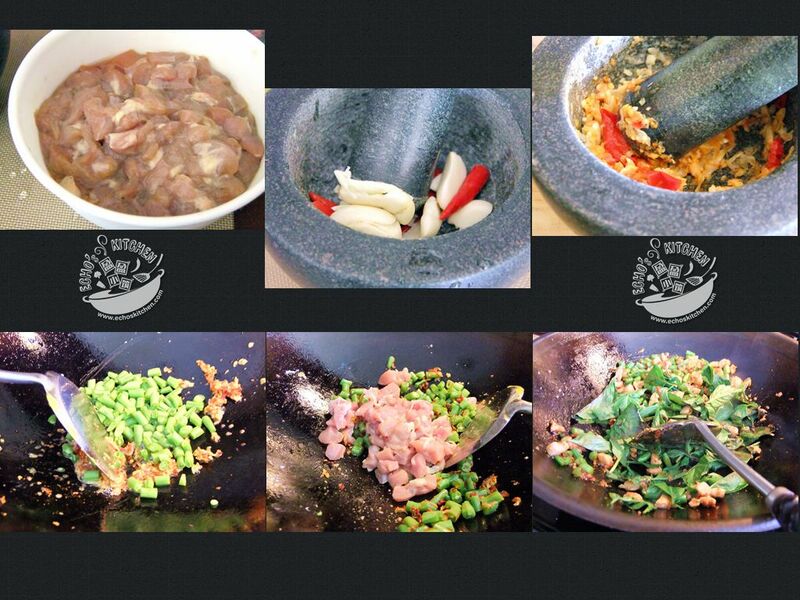 Peeled garlic and remove stem from Thai chilies, pound both in a mortar and pestle until it is crushed. Note: You can also mince the garlic and chilies on a chopping board, many swear by the difference in taste by pounding the ingredients, which I had come to appreciate very recently. 3. Heat up 2-3 tbsp of oil in a wok/cooking pan, cook the pounded Chilies and garlic until fragrant. 4. Add the diced chicken and long bean, stir until chicken changes color. Season with fish sauce, soy sauce, oyster sauce and sweet soy sauce. Continue cooking for few more minutes until chicken is fully cooked. 5. Add holy basil leaves before turning off the stove, stir until the meat and leaves are well mixed and leaves started wilting.